This week is National Vegetarian Week (21st – 27th May). The idea is to promote inspirational vegetarian food and raise awareness of the benefits of a meat-free lifestyle. Whilst one does occasionally come across the odd vegetarians who seems to subsist on little more than beans on toast, cheese and chips, I am sure most of us know that it is perfectly possible to follow a healthy, delicious and varied vegetarian diet, if one chooses. Indeed, my mum was a vegetarian until she moved to the UK in her early 20s, and most of my relatives in India follow a vegetarian diet. Although she did eat meat for a couple of decades, mum has moved back towards vegetarianism, though she is most accurately described as pescetarian, as she has retained fish and seafood in her diet. Whilst I can’t see me giving up meat any time soon, there are certainly many reasons to reduce the amount of meat I eat, including my health, the environment (it takes more energy and land to produce meat than fruit and vegetables) and of course, my wallet. (What meat I eat I want to be good quality, responsibly reared and delicious and that means paying more for it). With so many vegetarians in India, it’s no surprise that the cuisines of that country – I use the plural because there are such enormous regional differences – offer a great way for vegetarians, and those simply wishing to reduce their meat intake, to enjoy meat-free meals that look, smell and taste great. I know this and yet, I’m not very good at putting it into practice. Recently, I heard about the special menu that Cinnamon Kitchen has devised in celebration of National Vegetarian Week, and was invited along to sample it ahead of it’s launch today. The set menu features 5 vegetarian courses, is priced at £25 per person and is available from the 21st to the 31st of May. Cinnamon Kitchen is is the 2nd restaurant in a group of three, the first being The Cinnamon Club which opened a little over 10 years ago. Cinnamon Kitchen opened in 2008 and the latest sibling, Cinnamon Soho, just a couple of months ago. 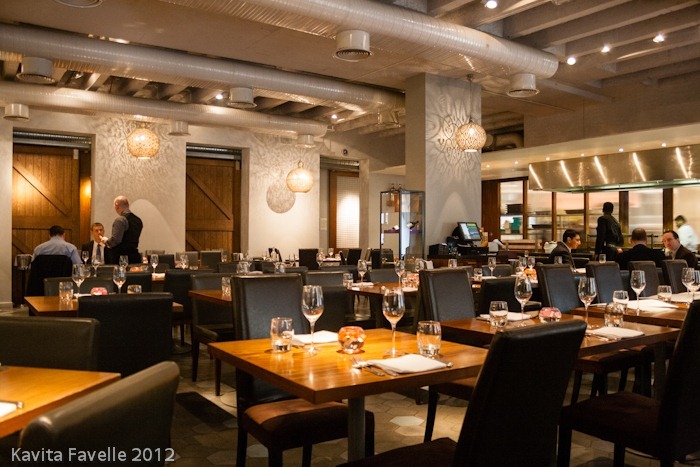 Executive chef of the group is Vivek Singh but CK’s menu is the work of head chef Abdul Yaseen. Yaseen worked with Singh for almost a decade, before taking the head chef role at Cinnamon Kitchen when it opened. 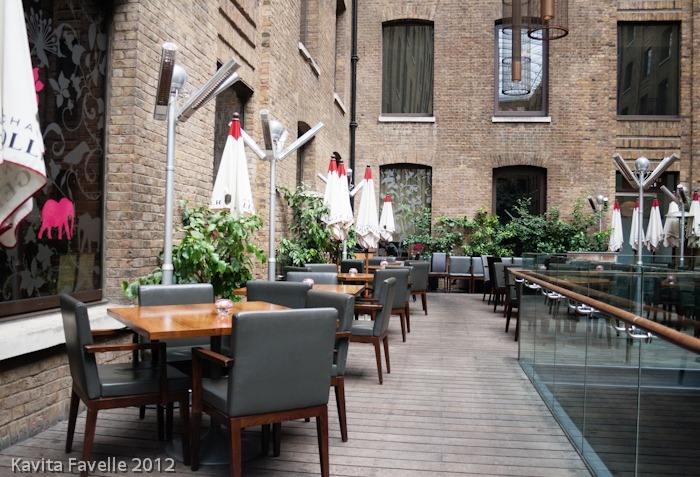 Cinnamon Kitchen has an enviable location within a beautifully modernised old warehouse complex located in a leafy square a stone’s throw from Liverpool Street station. 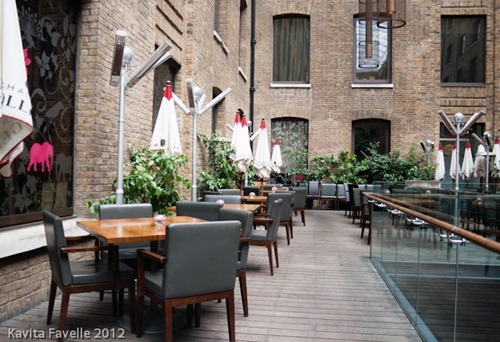 The restaurant entrance opens into the enormous glass-covered Western Courtyard where outdoor tables benefit from lots of light (or a view of the stars) yet are protected from rain and wind. Inside, to the left is the Anise bar lounge and to the right the main dining area, with space for over 100 covers. 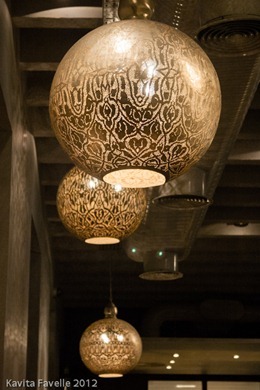 As is common for Indian restaurants these days, it’s an attractive space with warm brick walls, modern furniture and enormous globe light fittings. Along one side is an open tandoori grill with a long row of bar stools, like a Japanese sushi bar. Behind, frosted windows give hints of frenzied activity in the main kitchen. My friend Rachel and I chose a table in one corner, from where we could watch the restaurant fill to bursting with local office workers and empty again only an hour later. Whilst I do often order vegetarian dishes when eating out, it’s rare for me to choose an entirely vegetarian selection for all courses, so I was genuinely curious as to whether I’d miss meat during the meal. 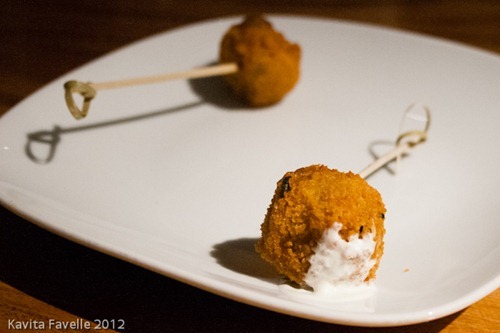 Before we started on the set menu, we were served an amuse, sent to all the tables. A spherical bread-crumbed potato fritter served on a stick, with gooseberry chutney and a little natural yoghurt, the fritter was soft and crunchy, and the gooseberry chutney a perfect balance of tart, sweet, spiced fruit. My only suggestion would be to be more generous with it, as just the tiniest smear was dabbed onto the potato fritter. As the first two dishes from the set menu were served chef Abdul Yaseen came to tell me more about the dishes themselves and shared his cooking philosophy for Cinnamon Kitchen. I tasted of one of the dishes and commented on how absolutely familiar and authentic the taste was, a surprise given the modern presentation of the dish. He responded that his “food is very much within the roots of Indian cuisine“… he aims to share a “modern Indian cuisine” which is “not fusion but innovation“, that is to say he “stick[s] to traditional recipes but play[s] with textures and presentation“. He wants to create “layers of flavour” and “to highlight the ingredients“, which themselves are “adapted to the seasons” here in the UK. 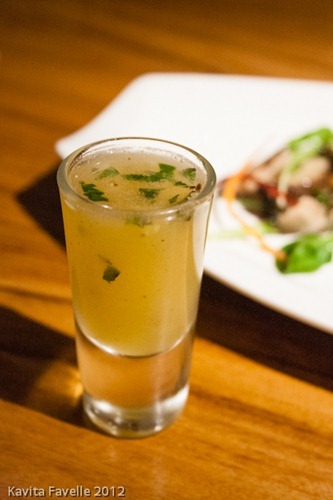 A shot glass of ambi panna was served ice cold. Chef Yaseen told us how he uses the first of the season’s raw mangoes, smoked in a hot oven before being combined with mint, fennel, cumin. Such a lot of flavour in such a small glass! I assume there’s also some chilli to create the intense combination of chilli heat and ice cold temperature… This amuse bouche really slaps the palate awake before the meal to come! 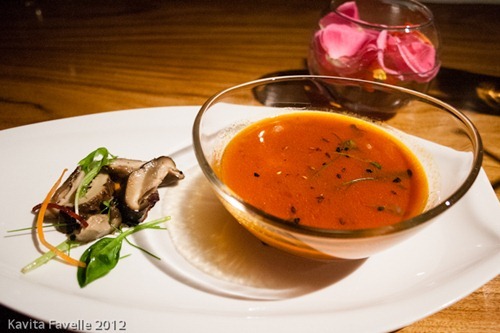 The menu describes the starter as smoked tomato & morel soup, pickled mushroom salad, coriander and lemon cress but chef Yaseen referred to the soup as rasam, a popular South Indian soup featuring tamarind water, tomato, pepper and chilli. As we tasted it, we immediately thought back to Yaseen’s words about layering flavours and using texture to present traditional dishes in a new way. Slices of morel and a few micro herbs gave more substance to the thin, fragrant and incredibly rich soup. The pickled mushrooms and salad added bouncy chew, sharp vinegar and fresh vegetal notes. Salty, sour, bitter, sweet, and umami – all five taste sensations were present in this one dish and all were perfectly balanced. 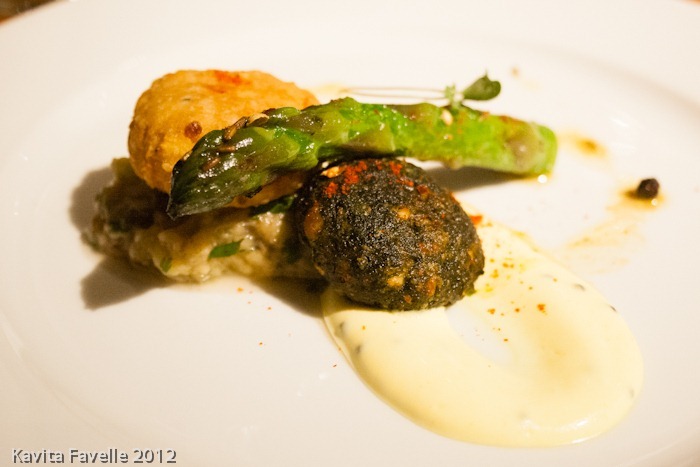 The “middle course” of hara kebab, chickpea and sesame cake, English asparagus, curried yoghurt, aubergine crush was also very good. The first thing both of us tasted was the aubergine, deeply, deeply smoky and silky soft, and with a little crunch in the form of diced raw red onion. The spinach kebab was soft and rich with a hint of crispness to the surface. The chickpea and sesame cake was cleverly lifted by sweet pepper. The asparagus spear was perfectly cooked with just the right amount of bite, and with lovely charred flavour to complement the aubergine. I liked the curried yoghurt better than Rachel, though it didn’t have as much flavour as it could have, I liked its tartness. This course really was superbly conceived. 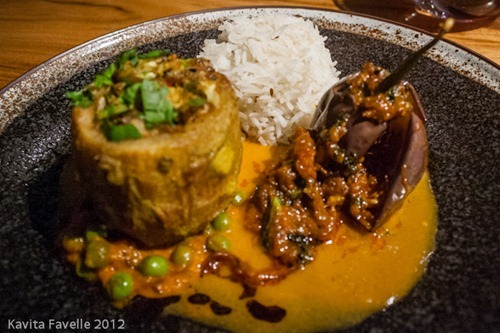 I loved the presentation of the main course of stir fried baby aubergine, cauliflower stuffed potatoes, curried petit pois, slow cooked onion gravy; simply plated, just like it might be at home, but taken to another level by the clever use of a hollowed out potato as edible bowl to the stir fried cauliflower! All the flavours were once again excellent, and very much familiar to those who’ve grown up eating Indian home cooking. The pea curry was probably my favourite, with the peas cooked just enough, bursting freshness in the mouth. The gravy pulled the plate together nicely. I even enjoyed the rice, served plainly but with that distinct delicate flavour of good basmati. My only criticism is that whilst the tomato-y flesh of my baby aubergine was soft and tasty, the skin was very tough, actually difficult to chew. 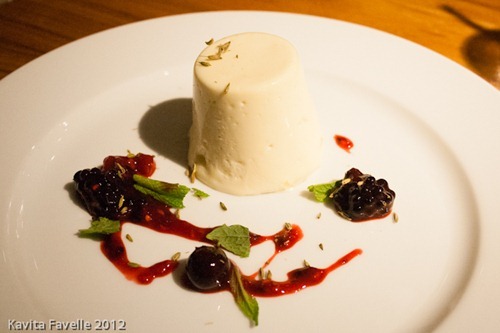 For dessert, Chef Yaseen stepped away from the Indian tradition and served a lemon grass panna cotta, seasonal berries compote, toasted fennel seeds. Those fennel seeds were the only nod to India, and actually I think they were superfluous. The panna cotta was superb, with wonderful wobble and the most delightful lemon grass flavour, gentle at first but singing by the end of each bite. The berries were cooked so briefly that they had a concentrated compote flavour but were still full of fresh juiciness and perfectly matched with the mint. I loved this and could happily eat it again and again. Full to bursting, we ordered masala chai, which was served with petits fours. As we drank our delicately spiced tea we reviewed the wine choices sommelier Carlos Pinto had chosen to match with the special menu. With the first two courses, he selected a pinot blanc from Alsace (Domaine Dopff). With the main, he served a Burgundy pinot noir (Domaine Chanson). And with dessert, a Bera Moscato d’Asti from Piedmont. Rachel felt that the matches were very well chosen indeed, and really worked well to bring out the best in both food and wine. By the end of our meal, we agreed that the menu was a big success. Neither of us had missed meat for a moment, and the variety of flavours, textures and visual presentation were hugely appealing. For £25, it was also excellent value. 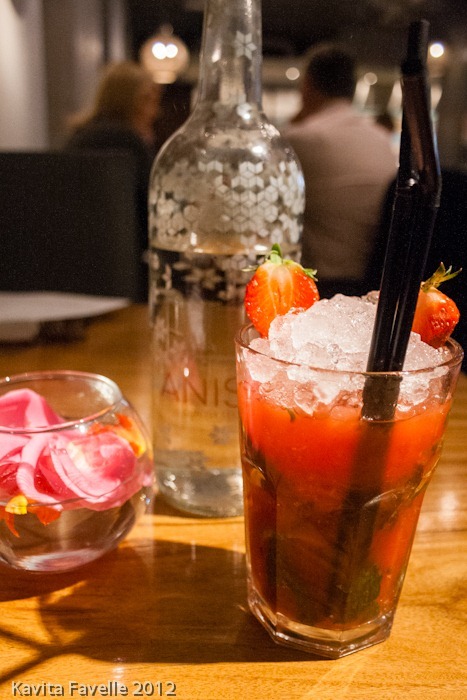 The menu is available until the end of May, and I hope it proves sufficiently popular that Cinnamon Kitchen decide to offer something similar on a permanent basis. Kavey Eats dined as a guest of Cinnamon Kitchen. 5 Comments to "Cinnamon Kitchen’s Special Vegetarian Menu for National Vegetarian Week"
Did it specify on the menu whether the pannacotta was vegetarian? Usually they are set with gelatine and it would be a disappointing end to the meal to not be able to indulge in the dessert. Emil, it didn’t specify. I’ll see if I can find out for you.